The River Birch - Betula nigra - is very true to it's name, growing naturally near the banks of Rivers, Creeks and other wet areas. In many areas even serving as a natural erosion control on banks and in low lying areas. The natural distribution runs in almost a U pattern accross the central and Eastern United States. It is found as far north as Massachusetts and Connecticut in the East, Wisconsin and Minnesota centrally, all along the banks of the Mississippi and South from Florida to Texas and Okalahoma. It can be grown as an ornamental almost nationwide but thrives in zones 4-9. The River Birch is a deciduous tree that is considered both an Ornamental and Shade Tree. The River Birch is the only Birch that bears lobed leaves with silver undersides. The leaves are a glossy green and are 2-3 inches long. Young trees often sprout new leads from a common stump and have a pinkish to coffee brown bark. 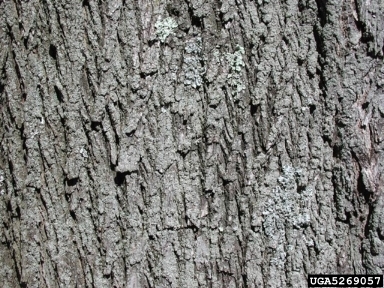 Mature trees can have bark ranging from a purple-gray with orange fissures to a cinnamon, some even have small scales. This variety of Birch is somewhat tolerant of drought but grows best in moist soil. It has beautiful bark that curls and peels offering interest year round. It is a rapid growing, growing from 13-24 inches in just a single year, when mature the reach between 40-70 feet tall with a spread of 40-60 feet. This tree produces brown & green catkins from April - May which are used by Redpolls and Pine Siskins, the very small but plentiful seeds are enjoyed by many Songbirds. The River Birch is readily available from most Nurseries in the US and can be purchased in many different sizes and shapes. Generally growing in an oval shape when multi stemmed it can also be found with a single main trunk. The Flowering Dogwood - Cornus florida - is by far the most common of all Dogwoods, there are about 40 varieties growing in mostly temperate regions of North America, Europe and Asia. Of the 40 varieties growing worldwide only 14 varieties of these trees and shrubs are native to America. Dogwoods for the most part are considered a small deciduous tree or shrub, they have a very slow growth rate and generally do not achieve great age or size. This tree is also considered a soil improver as the leaf litter tends to decompose more rapidly then other tree species. The crown grows in a bushy and open fashion with small green leaves that change to a beautiful red in the fall. The bark has a almost square pattern and is reddish-brown in color, in winter this is the main way to distinguish a Flowering Dogwood from other varieties of Dogwood such as the Kousa. The berries are a glossy bright red and are most showy when the leaves begin to turn, they grow in tight clusters at the end of a long stalk. The flesh of the fruit is mealy and bitter and encloses 1-2 seeds. Dogwood berries are poisonous to humans if consumed so NEVER try to taste these berries! The flowers are generally 3-4 inches across and are made up of 4 large bracts, surrounding a mass of tiny yellow-green true flowers, appearing before the leaves in early Spring, a welcome sight after a long winter! Native Americans used various parts of the Dogwood as a natural medicine. The root bark was used as a pain reliever, astringent, and anti-diarrhea agent. The flowers were infused to relieve fever and sooth colic pain. The bark was used as a fever reducer and often chewed to aid with sore throat. The Flowering Dogwood is a widely grown ornamental tree found at most nurseries. It thrives in zones 5-9. Well drained soil is best for Flowering Dogwoods as they are not tolerant to drought conditions or saturated soils. Full establishment of a new planting can take anywhere from 6-12 months for each inch of trunk diameter. The Sitka Spruce - Picea sitchensis - is the largest of all Spruces in the world and also the fastest growing. In it's native growth range along the Pacific Coast this variety has been found growing over 305 feet tall and over 50 feet around. This paticular Spruce has the greatest North to South range from the Kodiak Island region of Alaska, through British Columbia and south through California. The largest specimens are found in the Olympic Rain Forest area. It's name originated from the area of Sitka Alaska where it is also commonly found. The oldest known Sitkas are estimated to be over 700 years old. The Sitka is one of the prickliest of all Spruces with very hard stiff needles that are almost spine like. The old trees have broadly columnar crowns made up of large gently arched branches with short hanging shoots. 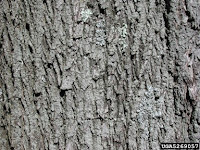 The bark is thin and scaly in appearance, it flakes off in circular plates. The seeds are black with a small brown wing. The cones grow in slender cylinder shapes and hang in a pendulous manner. The native range of the Sitka is a predominately wet area, because of this the root systems are relatively shallow. It grows predominately in wet areas such as the Pacific Rain Forests, Floodplains, and Inlet areas off of the Pacific Ocean. In it's native region this tree is a rapid grower, in some cases adding more then a cubic meter of wood to it's size each year. The Sitka is a very important to the lumber and paper products industry. It is relatively knot free which makes it a great wood for sound conduction, because of this quality it is commonly used in piano. harp, violin and guitar production. It was notably used to craft the Wright Brothers Flyer, as well as many other aircraft prior to World War II. Many decades of heavy logging has left very few old growth Sitka stands remaining. 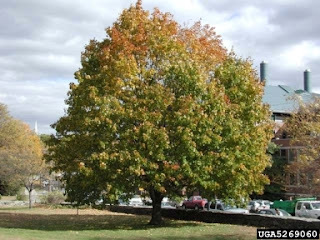 The Norway Maple - Acer platanoides - is a Medium-Large Deciduous Tree that is extremely sturdy. The average height when mature is between 60-100 feet tall. This tree is known to withstand tough winters, ice, wind and even contact with road salt. 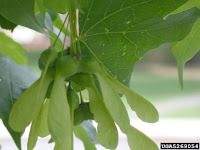 It is very similar in appearance to the Sugar Maple and the two are often times mixed within planned street plantings-this usually is a result of being confused for the same variety even at the nurseries. Both are commonly planted as street trees for oth their consistent growth habit and their sturdiness. It grows best in zones 3-7 here in the United States, but is actually native to Eastern-Central Europe from France to Russia and Scandinavia and much of Southwest Asia. The Norway Maple has smooth and very finely fissured bark that has a shallow network of ridges. It's sap is milky in consistency and not clear like some other Maples. The flowers have prominent yellow petals that come out shortly before the leaves. The wings on the fruit curve outwards away from on another, they are often referred to as helicopters because of the way they spin when falling to the ground. The leaves begin as a bright green in the spring that changes to orange before becoming a bright yellow in the fall. The Yellowwood Tree (Cladrastis kentukea) is a medium sized deciduous member of the legume family. With it's smooth elephant grey bark, pendulous fragrant flowers, and red/brown stems it offers beauty to any landscape year round. It is native to the Eastern United States, mosts notably two very small areas, one runs along the Kentucky and Tennessee border, and the other between Missouri, Arkansas and Okalahoma. It is commonly planted in landscapes from New England south to Washington DC & Virginia. Yellowwood is hardy from zones 4a to 8b and can be purchased from most large nurseries in the Eastern US.